Looking for a native fruit tree to plant in your forest garden? 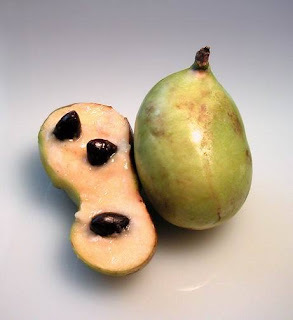 If you are in North America, let me suggest the Pawpaw. 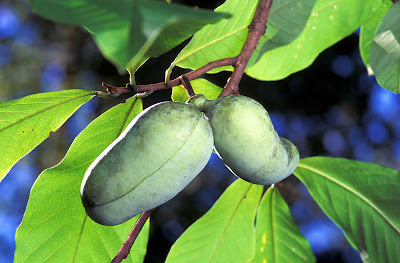 The Pawpaw (Asimina triloba) is a small deciduous fruit tree most commonly found near creek banks and river bottoms in the understory of rich broadleaf forests of the eastern United States. It has the largest edible fruit native to North America, with a flavor somewhat similar to banana and mango. It is notable for having more protein than most other fruits. The Pawpaw tree fits in as excellent understory tree in a large forest garden, or even as the main fruit tree in smaller forest gardens. The fruit is both tasty and highly nutritious, containing a surprising amount of protein. Another advantage of the Pawpaw is that it has few pests and requires little or no pesticides in its cultivation. In fact, its leaves, twigs, and bark contain natural insecticides known as acetogenins, which can be used to make an organic pesticide. Pawpaw seeds also have these insecticidal properties. Native Americans dried and powdered them and applied the powder to children's heads to control lice, and today specialized shampoos for eliminating lice are made using compounds from pawpaw seeds. Pawpaw flowers are pollinated by carrion beetles and blowflies, but have a weak scent which can limit production. Some growers place rotting meat near the trees to increase the blowfly population to help with pollination. The Pawpaw tree is the only larval host of the Zebra Swallowtail Butterfly, so by planting Pawpaws you are helping the survival of the Zebra Swallowtail. According to The Pawpaw Foundation, "since 1900, numerous individuals, including the renowned botanist David Fairchild, have collected superior clones from the wild and worked at improving the pawpaw. Roughly a dozen named varieties exist; most notable are Sunflower, Overleese, and Taytwo." It is common advice within the prepper community to have some "junk" silver as a hedge against inflation and an alternative means of exchange in case of a collapse of the dollar. This article is meant as a Prepper's Guide to Junk Silver. Precious metals, such as gold and silver, have been widely accepted as a form of economic exchange (currency) for all of human history. Unlike paper currency, gold and silver cannot be mass "printed" by governments and therefore cannot be "devalued" by inflation or government policy. If governments try to outlaw the use of gold and silver as a means of economic exchange, even banning private ownership, its long and universally recognized history as a form of currency ensues a robust black market. Therefore, gold and silver are seen as a solid hedge against inflation, a safe storehouse of wealth, and an alternative means of economic exchange during and after any economic crisis, including the collapse of the dollar. What is Junk Silver? The term junk silver is a bit misleading. Coins described as junk silver are by no means "junk" and can be quite valuable due to their silver content. The term is only meant to distinguish coins with little or no collectible premium above their silver content from coins that do have a collectible premium (rare coins, higher grade coins, key dates, errors, etc.). Junk silver coins are mostly circulated coins (which show wear) from before 1965 and which typically contain 90% silver. Most coins minted in 1965 and later contain no silver. There are a few exceptions, which are noted on the chart below. Remember, junk silver coins are those with little or no collector premium above the silver content. Many high-grade coins, rare coins, key dates, and errors have a collectible premium, and therefore are not true "junk" silver since they may be worth considerably more than their silver content. How much is Junk Silver worth? The price of silver changes almost daily (actually constantly throughout the day). You can check financial websites for the current price. Or just bookmark this website (www.TimGamble.com) where you can find the price of silver (and gold, oil, and natural gas) in the upper right-hand column. You can figure out how much you are being charged for the silver in junk 90% silver coins by applying the .715 rule (there is .715 troy ounce of silver per $1 of face value of 90% silver US coins, of any combination). First, divide the amount being asked by the face amount of the coins to get the amount being asked per $1 of face value. Then divide that amount by .715, and the result is how much per ounce of silver is being asked. Example: Ten Washington silver quarters are being sold for $43. How much is being asked per ounce of silver? Face value being sold is $2.50 (10 X .25). Asking price of $43 divided by face value of $2.50 is $17.20, which is the amount you are paying per $1 of face value. $17.20 divided by .715 is $24.06. Therefore, you would be paying $24.06 per ounce of silver. Please note that the .715 rule doesn't work with war nickels, 40% Kennedy halves, 40% Eisenhower dollars, and Silver Eagles because the silver content for those isn't 90%. Another way to find out the melt value of coins is to look on the website coinflation.com. When you sell to coin dealers, you can expect them to offer you less for your junk silver coins than the silver content is actually worth. Remember, this is how the dealers make a living, so you cannot expect full price from them. Most dealers will offer between 60% and 90% depending on several factors, including what exactly you are selling and the demand for junk silver that they are currently experiencing from there customers. If you feel their offer is too low, make a counter offer or try a different dealer. Why Junk Silver? In case of an economic crisis, including a collapse of the US dollar, there will be a need for an alternative to the dollar as a means of economic exchange. Barter (I'll give you a dozen eggs in exchange for a gallon of milk) will be one means of exchange, but there are difficulties with barter, which is why coinage developed in the first place. Gold will be useful for large purchases (such as a home), but will be too valuable to be practical for small purchases (such as a dozen eggs). Silver coins, on the other hand, will be much more convenient for smaller purchases. And since the value of junk silver coins comes mostly from their metal content, and since they come in denominations and designs the general public are already familiar with, they will be quickly and easily accepted as a form of currency. How much do I need? How much you junk silver you need to include in your preps is something you will need to figure out for yourself, and will depend on what your personal concerns and circumstances are, and how much you can reasonably afford. I will say that acquiring a lot of junk silver is something you should only do after covering the basics of your prepping (food, water, and other supplies), and that you should never go into debt to buy junk silver. What types of silver coins should I get? That is up to you, but I stick with circulated US dimes, quarters, and halves that are 90% silver. These are easily recognizable by the general public, and I avoid any possible confusion over the 35% and 40% coins. I also don't have to concern myself with any collectible premium. Morgan and Peace dollars would also may be good choices, but are somewhat less recognizable by the general public. Silver Eagles (which I do also collect, but don't consider part of my junk silver) aren't circulated and carry a collectible premium. Foreign coins and commemorative coins may contain silver, but will be much less recognized and accepted by the general public, so I avoid them. Where do I get Junk Silver? There are a lot of places you can get silver coins. Start by looking through the change you already have in your pockets, piggy bank, or that jar you drop loose change in when you empty your pockets at night. Be sure to always check the change you get everyday. Though uncommon, there are still some silver coins in circulation. You can buy rolls of dimes, quarters, and halves from your bank. You can then search the rolls looking for silver coins, then return the rest. There is no risk in this method, since even if you find no silver coins, you still have the same face value that you bought. It is a bit of a hassle for the banks, so some banks/tellers may be a bit grumpy about it, but most will work with you. Search You Tube for Coin Roll Hunting for more information. You can also buy unsearched rolls of coins from coin dealers and off of eBay, but these will usually charge a slight premium over face. Also, how do you know if the rolls are truly unsearched? I personally would not buy unsearched rolls unless I knew and trusted the dealer very well. Visit local coin dealers. They will have a lot of junk silver coins you can buy, both loose and by the roll. You will pay a slight premium over the price of the silver content (but that is how the dealer makes a living). How much a premium will vary from dealer to dealer, and will depend on how much and what exactly you are buying. Shop on eBay. Do an eBay search for Junk Silver and you will get pages of results to shift through. Be cautious! Especially with dealers who are not local to you. Pay attention to their customer reviews and feedback score; deal only with established dealers with very high scores. Read carefully the written description of the item and make sure you know what you are bidding on (don't go just by the photo). Make a small test purchase from a dealer first to see how it goes before making any larger purchases from that dealer. Visit local flea markets, antique shops, and yard sales. You can often find coins being sold by non-dealers who don't pay close attention to the daily fluctuations in the price of silver. The opportunity is for some really great bargains. You can also buy from the many large gold and silver brokers that often advertise on talk radio and the financial cable networks. So, Junk Silver is a good investment? Maybe. Maybe not. I am not discussing junk silver as an investment, but rather as a storehouse of wealth, a hedge against inflation, and a potential alternative to paper money as currency. I buy junk silver in order to protect my purchasing power, not in hopes of making a return on an investment. 1) This article is an introduction to junk silver as a part of preparing for difficult times. It is not an article on coin collecting as a hobby or investment. 2) I am not a financial professional, and nothing presented here is meant to be taken as professional advice. Should you need or desire professional financial advice, I suggest seeking a licensed financial professional, who will provide personalized advise based on your own concerns and circumstances.